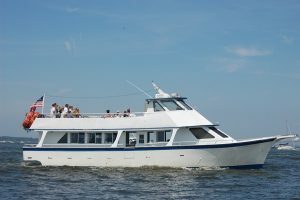 Whether relaxing with a few friends or hosting a party for dozens of people, there is no better way to experience Annapolis than from the water aboard The Sea Spirit. The Sea Spirit is a 60′ custom-built yacht, certified by the U.S. Coast Guard to carry 85 passengers. The vessel is climate controlled for year round operation, so no matter the weather you will be cruising in comfort. The enclosed main deck features a yacht-like interior with wall-to-wall carpeting, bar and comfortable seating. You will love the view from our open-top deck, bow, and sides which offer tremendous vantage points for spectacular sightseeing. For your refreshment, an optional cash bar and catering services are available for an additional charge. Planning an event? Complete the form and you will be contacted shortly, or give us a call today to inquire about availability.